Cut the garlic head in half along the “equator” (with root and stem ends representing the poles). To remove the garlic, turn heads upside down and gently squeeze the garlic out of the skins. 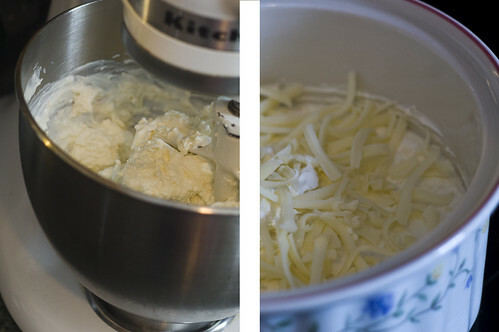 With a food processor or electric mixer, blend cream cheese, Asiago cheese, heavy cream, and sour cream until well-blended, add garlic and blend again. Place mixture into a casserole or baking dish and top with shredded mozzarella. Bake about 20 minutes until golden brown on top. Serve with firm crusty bread, crackers, pita bread, or whatever. I’m expected to make this every Thanksgiving, and now the family wants it on Christmas as well. I’m pretty sure it’s the only reason I get invited… Anyway, here’s the recipe, so now you can make it yourself and I don’t even have to show up! But seriously folks, after it shows up, this stuff is gone in like 10 minutes, and people who miss out on it are sad and have even been known to cry. So don’t ruin the day, make your own Roasted Garlic Asiago Dip and be the Hero of the Holidays! Posted on Friday, December 24th, 2010 at 12:24 pm. Subscribe to the comments feed. Both comments and pings are currently closed. Post on your own blog. I am totally making this at some point. It sounds amazing.